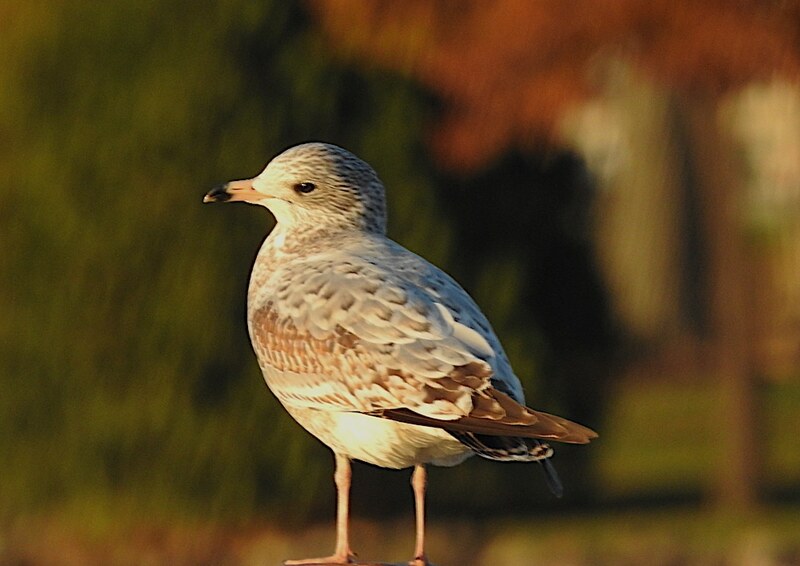 I promised you a juvenile ring-billed gull yesterday, and now I’m delivering. It was a beautiful day for taking photos because the sun was out. My first attempt at taking a photo of a juvenile failed, because something spooked it—possibly me, even though I was twenty yards away—and it flew off. But toward the end of the walk, I noticed this one standing on the pier, and that it was a juvenile. Score! As for “my” gull from today, you can tell it’s a juvenile because it has a mottled pattern of grey and brown all over, with no clear patches of white on its neck or head. But I’m guessing it’s at least a year old, due to it already having a ring on its beak (the ring usually forms after the first winter) and its upper wings leaning more toward smooth grey than speckled.